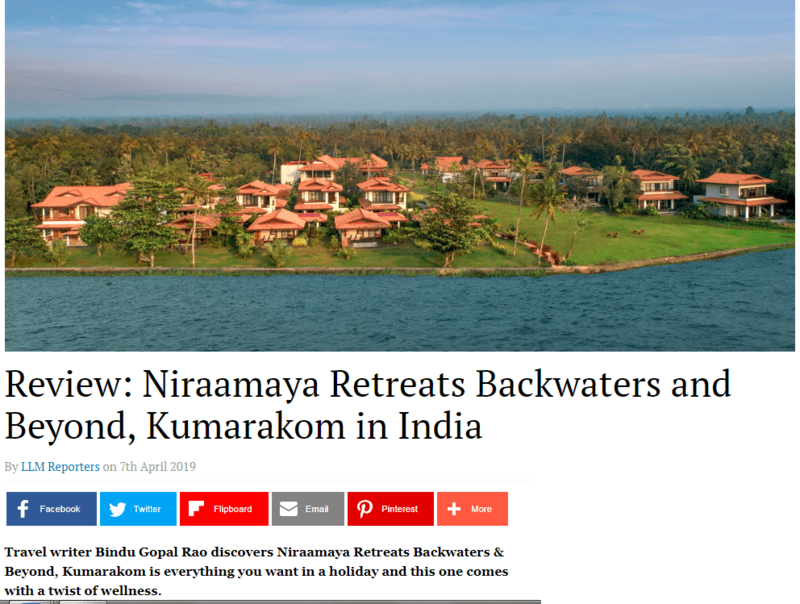 Niraamaya Retreats Backwaters & Beyond, Kumarakom is everything you want in a holiday and this one comes with a twist of wellness. The eight acre property is set amidst lush tropical gardens and only houses 27 luxurious villas with many of them overlooking the Vembanad Lake. The property has been designed keeping local architectural motifs like sloped roofing use of wood, clay tile roofs and has an extensive use of stone, laterite and local timber. The experience starts from the extensive lobby space that overlooks a landscape garden and is framed by the lake. The décor is completely local with wicker chairs, traditional lamps and a wooden swing that adds an element of rustic charm. Located on an elevated level, the view of the lake is absolutely breathtaking from here. The room interiors are inspired by Colonial Kerala and include solid wood furniture that has been handpicked including a beautiful four poster bed, wicker chairs, a sturdy wood table as well as a wooden console for the television. The bedside tables are also in wood and are fitted with draws so there is enough storage and the large cupboard has a locker. 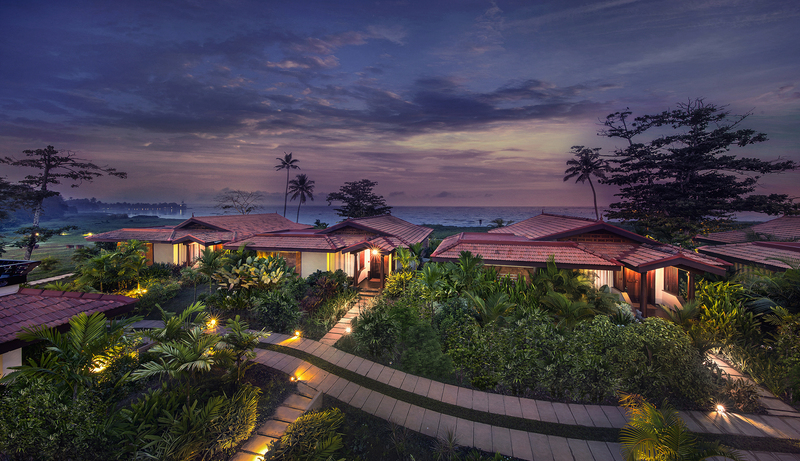 The resort has rooms of varying categories and the best part is all the rooms are expansive. The Premium Water-Front Villas come with uninterrupted views of the serene lake and also have a private sun-deck with plunge pools and more. The Luxury Private Pool Villas on the ground level come with private plunge pools and a sun-drenched deck with verdant views of the lush tropical gardens. The Superior Lake-View Villas are a level above ground and apart from beautiful of the backwaters from its private balconies. A walk-in wardrobe, powerful body showers and open-to-sky bath gardens with rain showers are part of the room. The Grand Presidential Suite is a testament to all thing uber luxury and offers a stunning view of the backwaters and is located on a level above ground with exclusive access through a private glass elevator. The plush interiors come with panelled walls, dark wood flooring and stunning art by artist Ravi Varma. 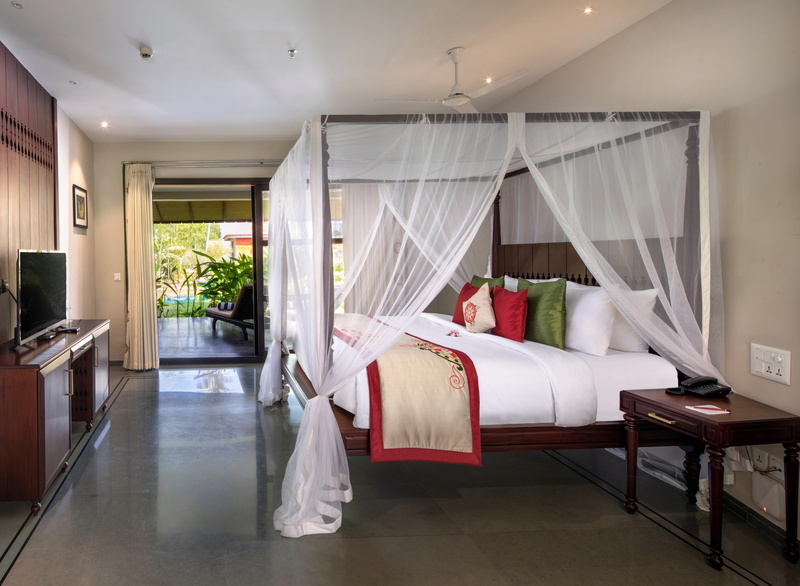 An open-to-sky bath garden, massage shower in the indoor bathroom and terrace views of the serene backwaters apart from a separate dining space and private balcony make this room easily the best one on the property. The rooms are serviced twice daily in the morning as well as turn down service in the evening. Apart from chocolates in the room I was impressed by a small note on Mudra Moments in the room where a small picture depicting how you can use the innate healing power of your hands for your health. I had a picture of the Linga Mudra aimed to boost immunity and keep respiratory ailments at bay in my room. The Linga Mudra is simple and all you need to do is intertwine the fingers of both your hands and clasp them together. Hold the thumb of your left hand erect and encircle it with the thumb and index finger of your right hand. Press your hands on your navel. Simple yet effective and it is these small elements of wellness that you can also take away into your daily routine from here.